Serendipity Reviews: Are You Feeling Festive? Hi everyone, sorry I have been away all week, but I do feel much better for taking a week out. I have managed to do all my Christmas shopping and I have nearly wrapped them too. The decorations are all up and the house is looking really festive. All I have left to do is buy the food and drink for Christmas. So now that I am gradually moving into the festive spirit, I thought it only best to review one of the Christmas books I managed to read this weekend. The Christmas Box is a relatively short book and can be read easily in one sitting. It may be a very short book, but it packs one hell of a punch at the end. The story is about a young family who are struggling to make ends meet and get an offer to move into an old mansion with a lonely widow. The move benefits everyone in the household. The family begin to turn their finances around, even though Paul struggles to fit in family life with the growing amount of work. Mary, the widow benefits from the company of the family, especially the little girl. The story follows their lives in the run up to Christmas and you find yourself immersed in a lovely American way of life. Within the book a couple of important questions are asked and both of these questions stuck with me. The first one asked was 'Which of your senses is most affected by Christmas? For me, I knew instantly that my sense of smell was the most affected. I love nothing more than the smell of cinnamon and oranges wafting around the house. I buy scented oils to burn and I love the aroma they give off. I also love the smell of the turkey cooking on Christmas evening, tantalizing my taste buds at the same time. Also the smell of mulled wine, warming on the stove. I love the smell of crisp frosty mornings, that actually hurt your nose when you inhale. Also the smell of the freshly cut Christmas trees at the garden centres waiting to be taken home and decorated by a family that will love them right through the festive season. As a child, the smells that I remember clearly are the ones of my mum cooking. I used to love it, when she began cooking sausage rolls and mince pies the week before Christmas. Now you know which of my senses is affected the most, I would love to know which of your senses is affected the most and why? The second question asked in the book was 'What was the first Christmas gift given? Now I knew the answer, but it didn't come to me straight away. The answer was a parent's love. Now you know I am not religious, but I found that really powerful and it made me think about what is really important at Christmas. It is not the presents,not the cards, not the cleaning of the house, but spending time with the people you love. I loved this book, I thought it was absolutely beautiful and I would recommend it to any parent who is struggling with the run up to Christmas. This book makes you realise what is really important in life. You need to look at what you have around you and feel blessed to be so lucky. I read this book and felt very emotional when I finished. I know I spend my life rushing here, there and everywhere and never really appreciate what is under my nose. This book has definitely made me reevaluate the important things in life. Glad that you are feeling so much more refreshed after your week off - its good to have you back. Am enjoying participating in the Christmas reading challene even if I am finding seasonal books a little difficult to get hold of at the library. So glad you're feeling better! 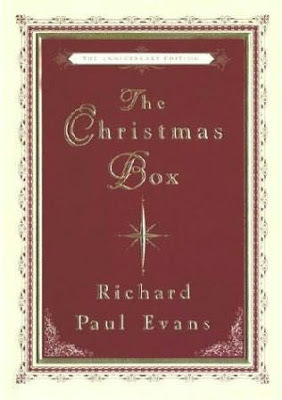 I read The Christmas Box years ago and just loved it - that book will put you in the holiday spirit for sure. This sounds like a wonderful book! I wish I had it on hand to read as one of my books for the challenge. I'm thinking maybe sound for the sense that is most affected during the holidays. I love all the Christmas music and many of the songs brings back lovely memories of Christmases past. This is a wonderful book! Some books sure cause us to reevaluate things that matter in our lives. I love the smell of my mom's cooking too! sounds like a heartwarming read--perfect for the season. glad you had a productive week off--i have yet to do any shopping!!! i'm with you on the smells of christmas. wreaths and trees, the smell of cold air, blazing fires in the hearth, hot chocolate...they are all winners! I don't normally read these seasonal books but your review makes me want to pick this one up. It sounds like an absolutely beautiful read and just what I need to get me in the spirit of things. Your week off sounfds very good! Getting all of your Christmas shopping done is great! I really liked this book when I read it but that was a while ago. Your review brought back to me the wonder and impact of this book. It certainly amkes you think about life. You sure had a good week off and got a lot done. We still don't even have our tree up. I bet your place looks just beautiful. I think my sense of smell and sight is most affected. I love the smells of all the cookies and food cooking at Christmas. I also love the feast for the eyes when the tree lights are on and we have all our decorations up. It's a special time. I'd love to read this book. So many people have loved it. I have read Richard Paul Evans books before and I have read this one too. This is just a beautiful book inside and out. Great review Vivienne! Happy to hear you are getting stuff done and feeling better. This sounds like a book to boost the spirit. Thanks for bringing it to your blog. I will have to make my shopping excursion a Christmas theme now. I love the smell of bayberry and cinnamon. It is rare that bayberry is available any longer, but it reminds me of my mom. A long time past.